If you’ve started to think your lumber and building materials (LBM) business could be getting more from your software, it might be time for a change. Now is a great time to assess your current software, as recent technological innovations have offered up some very compelling reasons to take a look at the market. If any of these statements apply to your business, it’s probably time to make a switch. 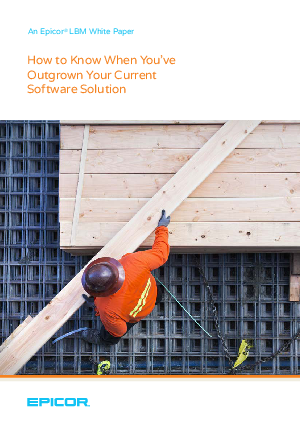 Read the white paper to see the other signs, and don’t let your software systems hold you back from taking your company where you want it to go. Consider whether your current software can deliver these advantages to your business. If your system falls short, it may be time to see what else is available. Read the white paper to get your evaluation started.